This month we shine a light on: Robert – the man behind the screen (and in the scene)! Hi Robert! What is it that you do behind the screen when we don’t see you in the scene? When I’m behind my screen I am creating most of the designwork for Willem. So that means everything you see offline, so all the posters, flyers, banners and things like that. But also all the online images you see on Facebook for instance. To be able do that I also created the house style of the dance school. 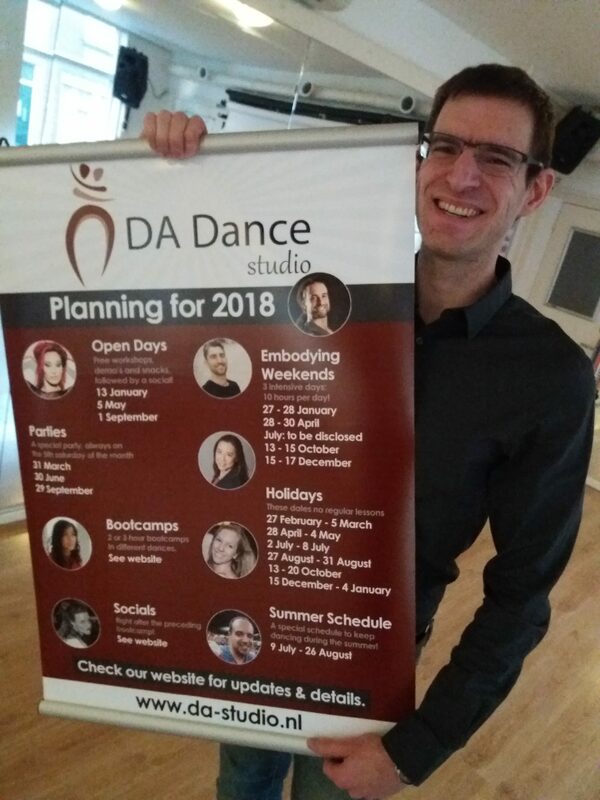 I took what Willem already had from DançAlegria, and with the name change to DA Dance Studio I redesigned it to accommodate the new name and feel. In extent to that I also built and maintain the website. So that means that I looked at the design of it, how does it look and feel, what should it do? I also looked at the backside, at the codebase. It should all be safe, functional and reliable. I’m not writing the code myself, like I said, it has to be reliable, so I look into the different codes that other developers wrote, and link that together into a nice and functional website. And what is the latest adjustment you did, that is important for all members? Next to that we also see you in front of the screen! Behind the bar! Yes I am behind the bar one night a week and sometimes in the weekends. I used to be there a lot more because I used to run the bar completely for Willem for a couple of years. Eventually I couldn’t combine it any more with my other work, so I had to make a choice. Besides freelancing in web management and graphic design I’m also known to help out Expats. But this year my main focus is on my new company: I am starting up an administration company together with a registered accountant, a more serious business! And then we also see you in the scene! What is it that you love about dancing? It’s freedom of expression, what you want to express, what you feel. For me it’s also a way to switch off my mind. I’m always thinking a lot and when I’m dancing I’m literally not thinking. The best dances I’ve had are the ones I have no recollection of what I did during the dance: the moves, the timings or the combinations.. None! It’s completely letting go and being in the sensation of the awareness of the music, your partner and yourself and nothing else. Everything and everybody else around you fades away. Literally being there in the moment. That sounds amazing. Can you feel this state in every dance? Not always. I started out in ballroom, about 10/15 years ago and I liked it a lot, but I couldn’t find this state in ballroom. After that I danced salsa and I couldn’t find it either, it was too much thinking for me. When I found Zouk 7 years ago I found that you can dance like this. I discovered this kind of freedom. I stopped my salsa classes the next season! And Samba for me is fun and playing, it’s a different kind of feeling that I love in a different way. Will you ever stop dancing? In some way I will never stop dancing! It may change in the way I dance or the intensity I dance with, I think that always evolves the way your life evolves, but I will always dance. I had a time that I danced six days a week. Now I’m back to one or two days a week with some parties. I still help out at parties and festivals. When you are in the scene for this long, you know a lot of people. Amongst my friends there are a lot of organisers so I help out a lot. That gives you a very different view from the dance scene and it’s nice to do! Thank you Robert for this interview and telling us about what you do and love! See you on the dancefloor or at the bar! !